200cc belt drive, pull start. 12mm Titanium frame. 200cc. 2 Stroke. 40:1 synthetic oil. Nylock long life pull start. 11.3kg engine with steel exhaust. Exhaust has built in dB reduction. Advanced internal & external engine cooling. Anti slip triple belt life technology. All bolts thread locked and position marked. Tuned for linear throttle response. Slim & light self locking buckles. Removable reduced weight side pockets. Made ready to fit optional side rescue pod. Internal ideally placed hip speedbar pulley. Extra thick padded shoulder straps. Breathable fabric in key areas. Fully lined safe reserve connection points. 2pc Carbon Fiber E-prop 125cm. Continuos carbon wrapped braided fibers. Race = Grade 9 Titanium. Double density titanium weight shift. Twin offsets to counter torque. 11.5 litre slim tank / optional 15 litre fat tank. Ready to fly with pull start Nitro, prop, carabiners, spark plug, harness, fuel tank, everything but the fuel. As pictured left. 19kg Titanium with standard 12mm hoop. 19.4kg Titanium with HD 16mm outer hoop. blast electro white or polished titanium. Air Conception provide a 2 year warranty. 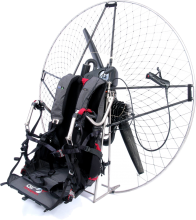 Click the button below to add the Air Conception NiTRO 200 Titanium Race Paramotor to your wish list.